As a soon-to-be-67-year-old advocate who’s been working on U.S. and international climate policy and politics for some 30 years—as well as the father of a 24-year-old daughter—I welcome the passion, energy, and directness these young leaders are bringing to the conversation. As I listened to the powerful statements that youth leaders made at the rally at the U.S. Capitol, I found myself experiencing a range of emotions: inspiration, hope, humility, and sadness. Youth activism on climate is certainly not new; for example, youth groups in Europe, the U.S., and other countries have been attending the international climate negotiations for more than 20 years, and in 2005, they formed the International Youth Climate Movement to coordinate their efforts. And the youth-driven Power Shift conferences that started in Washington, DC in fall 2007 and spread around the world have engaged thousands of young activists in the fight against coal and oil and for a clean, renewable, energy-efficient world. 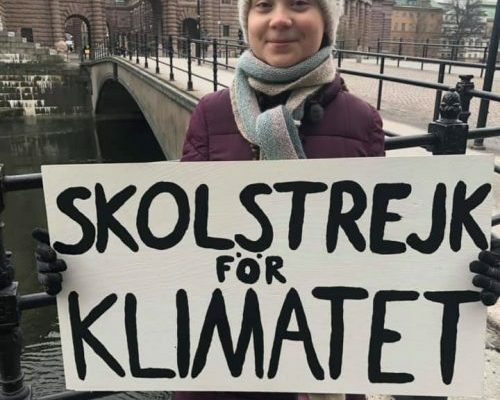 But the strategy of school climate strikes is much more recent; it began last August, when a then-15-year-old student in Sweden, Greta Thunberg—inspired by the March for Our Lives protests on gun control organized by students at Florida’s Marjory Stoneman Douglas high school—began what she called the Skolstrejk för klimatet (school strike for the climate). • Because decades of inaction has left us with just 11 years to change the trajectory of the worst effects of climate change, according to the October 2018 UN IPCC Report. • Because our world leaders have yet to acknowledge, prioritize, or properly address our climate crisis. • Because marginalized communities across our nation—especially communities of colour, disabled communities, and low-income communities—are already disproportionately impacted by climate change. • Because if the social order is disrupted by our refusal to attend school, then the system is forced to face the climate crisis and enact change. At the conclusion of each of the major international climate negotiating milestones over the last 30 years—including the Rio framework treaty in 1992, the Kyoto Protocol in 1997, and the Paris Agreement in 2015—my message to policy-makers and reporters has been frustratingly consistent: “this (fill in the blank) agreement represents an important step forward, but much more must be done.” For as the Chinese philosopher Laozi (or Lao Tzu) said, “If you do not change direction, you may end up where you are heading.” And as the world’s scientific community has made abundantly clear, where we are currently heading on climate change is unacceptable. When I first came to the Union of Concerned Scientists in 1989 to start up our work on climate change and energy issues, we had many choices, many paths to take, and many opportunities to avoid the worst impacts of climate change. The hard truth is that we didn’t make the choices that we should have, and now the paths ahead range from hard to hellish and the opportunities to avert truly catastrophic climate change are narrowing with each passing year. Adults of conscience feel real guilt and shame and sadness over this, as we should—along with deep anger at the short-sighted politicians and self-interested corporate leaders who have worked so hard to block progress at every turn. Alden Meyer is director of strategy and policy at the Union of Concerned Scientists. This post originally appeared on the Union of Concerned Scientists blog. Reprinted in full with permission.